Today marks the 40th anniversary of the Kent State Shootings. 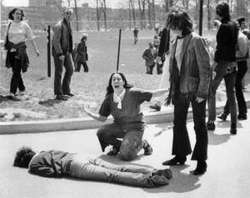 On May 4th, 1970, National Guardsmen opened fire on hundreds of unarmed students at an antiwar rally at Kent State University in Ohio. The guardsmen fired off at least 67 shots in roughly 13 seconds. Four students were killed and nine others wounded. However, sending in the National Guard complete with semiautomatic M1 Garand rifles (.30-06 FMJ rounds) with fixed bayonets to suppress these riots seems to be a bit of an overreaction on the part of the governor. ** The methods used to suppress these violent protests were very different from the less lethal methods police use today (which some say is a direct result of this event). Were the National Guardsmen’s deadly actions justified self-defense? A full 40 years later, this is still a subject of great debate. One thing which isn’t debatable is that this event was tragic and preventable. The war in which millions of educated and working class men sacrificed their lives to fight over the remnants of a Europe that was still ruled by Hohenzollern’s, Hapsburg’s and Romanov’s —Middle Age Europe’s inbred contribution to insanity. And what were they fighting over ? The same stupid battles that Europeans were fighting 100 years previously when Napoleon raged across the Russian frontier. Only this time, they were doing it with tanks, planes, and mustard gas. It was massacre writ large and insanity on display for four long years — and it all started when some guy got shot in Sarajevo. And yet, somehow, the boys of America ended up in the middle of this mess that the Royalists and Europeans has created. Rationally, there was no reason we should’ve been there and yet we were led by a man convinced that he could remake the world in America’s democratic image. That didn’t work out so well back then, as people unlucky enough to live in Europe in the 1930s and 40s can attest. Not to mention the men who the United States sent back to Europe in 1941. So as we remember Veterans today, and thank them for their service, perhaps it’s time to think about how we can stop creating so many gardens of stone in so many corners of the world in the name of misplaced idealism. Want to Serve Your Country? Well, What’s Stopping You! It is a unique moment for the idea of national service. You have two presidential candidates who believe deeply in service and who have made it part of their core message to voters. You have millions of Americans who are yearning to be more involved in the world and in their communities. You have corporations and businesses that are making civic engagement a key part of their mission. If “millions of Americans” wish to be “more involved” in service to others and “their communities” what’s stopping them? Do we really need a President McCain or President Obama to force “inspire” these Americans to serve their fellow Americans? Is their really a “volunteer” deficit? Polls show that while confidence in our democracy and our government is near an all-time low, volunteerism and civic participation since the ’70s are near all-time highs. Political scientists are perplexed about this. If confidence is so low, why would people bother volunteering? The explanation is pretty simple. People, especially young people, think the government and the public sphere are broken, but they feel they can personally make a difference through community service. I fail to see the problem here. If people do not have confidence in the government, this is a very good thing*! Ordinary Americans are helping others on their own volition, not because some politician told them to do so. [T]he way to keep the Republic — is universal national service. No, not mandatory or compulsory service but service that is in our enlightened self-interest as a nation. We are at a historic junction; with the first open presidential election in more than a half-century, it is time for the next President to mine the desire that is out there for serving and create a program for universal national service that will be his — or her — legacy for decades to come. It is the simple but compelling idea that devoting a year or more to national service, whether military or civilian, should become a countrywide rite of passage, the common expectation and widespread experience of virtually every young American. 7. Launch a Green Corps (similar to FDR’s Civilian Conservation Corps but would improve infrastructure and combat climate change). 8. Recruit a Rapid-Response Reserve Corps (a.k.a. volunteers doing the job the National Guard traditionally does in the wake of natural disasters). 10. Create a Baby-Boomer Education Bond (a.k.a. forced wealth distribution). In one way or another, every one of these proposals requires government to use force**. While this form of coercion is not as visible as directly “drafting” people into government service, make no mistake, coercion is still very much part of the equation. One of the comforts of middle age — a stage that the editor of TIME and I have both reached — is that you can start making demands on young people, safe in the knowledge that they won’t apply to you. Having safely escaped the Vietnam era draft ourselves, we are overcome by the feeling that the next generation should not be so lucky. Many of these young folks are volunteering for socially beneficial work, and that’s good. But it’s not good enough. “Volunteerism” is so wonderful that every young person should have to do it. I’m perfectly prepared to believe that today’s young people are deplorable specimens, ignorant and ungrateful and in desperate need of discipline. Or I am also prepared to believe that they are about to burst with idealism like a piñata and only await somebody with a giant pin. But they aren’t the only ones who could use a lesson about social obligation. What about grownups? Grownups, who still have some hope of collecting Social Security and Medicare before they go broke, who have enjoyed the explosion in house prices that make the prospect of home ownership so dim for the next generation; who allowed the government to run up a gargantuan national debt, were miraculously bailed out of that, and immediately allowed it to be run up a second time; who may well have gone to college when tuition was cheap and you didn’t automatically graduate burdened by student loans. We are not in much of a position to start dreaming up lessons in social obligation for the kids. Let’s be honest. If you really want to “serve your country/community/world,” again I ask you: What’s stopping you? Your level of service has not one thing to do with who occupies the White House at any given time.